You’ve been through all our lessons and are ready to start painting in acrylics! Learning is doing and you’ll improve your skill the more you work on it. We strongly suggest you follow the lesson plan that follows before striking out on your own. We profusely thank the author, Will Kemp at www.willkempartschool.com for allowing us to use these four videos as well as the exercises that follow in the next three lessons. All great tutorials! If you like, you can always open the YouTube video in a separate tab in your browser to make it simpler to switch back and forth between the video and the text in our lesson. To do this, simply click the YouTube button in the lower right hand corner of the video that’s in the lesson. This will open the video in a new tab on YouTube. We recommend watching the video in full screen mode. For more information on YouTube, see our Being A Successful Student post. For information on YouTube’s Closed Captioning, see this post here. The first three painting exercises use only three colors. After that, you will need more colors if you want to paint exactly what we have suggested for the painting exercises. If you absolutely cannot afford more than three colors, that’s fine—lots can be done with the three we suggest! These videos pull together some of the things we’ve discussed in our lessons. The videos in total will take about 15 minutes to watch. When you’re finished painting for the day, you’ll need to clean off your palette. Unlike watercolor paints which can be reconstituted with water once they’ve dried, acrylic paints cannot be reused once they’ve dried. If you’re using a Sta-Wet palette (as we recommend), you’ll be able to keep the paints for longer. If you’re using a standard plastic or wood palette, the dried acrylic will adhere and make it difficult to remove later on. A “ground” is a surface you paint on. For example, gesso is a white ground. In this video, Will Kemp suggests using a Yellow Ochre ground for still life and landscapes and a Burnt or Raw Umber ground for portraits. Use a house painting brush or the largest brush you have to apply the ground quickly. Remember to paint the sides of your canvas too so it looks finished even without a frame when you hang it on the wall. If you’re using liquid soap, put a little in your hand and wash your brush just as Will Kemp does in the video. If it’s a cake soap (like the one he’s using), you’ll need to rub the brush on the soap first. He talks about using paper towels in the video—you may use paper towels also or a rag will do just as well. This video is a bit longer but has some really good tips for beginning painters. 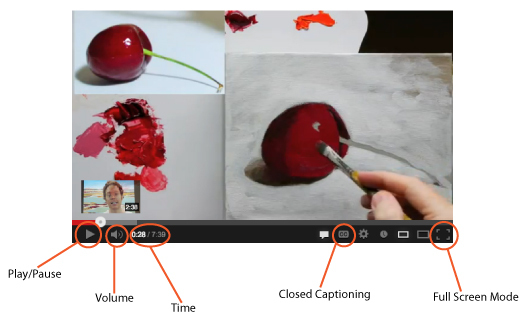 Once you’ve finished watching the videos above, you can move on to actual painting! Make sure you have all our recommended supplies to get started (to buy on Amazon, click here). You can use any size canvas with these tutorials, but the bigger the canvas, the more freedom you have to move and paint without getting too fussy with your details. We would suggest no smaller than 8” x 10”. Get your space and work materials all set up then watch the videos in the order below for some great tutorials. We recommend you watch the video before you start each exercise so you’ll have an idea of what to expect. You will probably want to watch the video as you’re painting, so make sure you have a computer and an internet connection in your working space/studio. Pause and rewind if necessary and if you get paint on your mouse, either wipe if off with your paint rag while it’s still wet or scrape it off with your fingernail when the paint dries. You will need to draw your image onto your canvas, so if you haven’t already, check out our Drawing section for some tips on how to draw. If you’re not sure how to get your image onto canvas or don’t want to rely on your drawing skills alone, take a look at our Quick And Dirty Tricks For Getting Your Image Onto Canvas. The next three lessons will get you started with painting. Of course, you can skip around if you like, but we’ve ordered the videos in the way that we feel will best suit the beginning painter. We’ve set up each lesson in Parts that each take up to 1 and 1/4 hours to complete. This time includes approximately 20 minutes to watch that exercise’s video, and 10 minutes to lay out you paints on your palette and post painting cleanup. We suggest those who have trouble hearing the instructor use the closed captioning (CC) feature during their initial viewing of the video. Our CC experience is that they do a very good job capturing the instructor’s words—but do expect some humorous misses now and then! If you feel like you need help, write in to the comment section at the end of each lesson or use our contact form to ask key questions not addressed in the comments section. We’d like to see your progress! If you feel you’ve been successful with the paintings in the lessons, submit photos of them to us using our submission form. If you want more instructional videos once you are done with the three exercises, you can always check out the Student Resource Center for more tutorials and information.